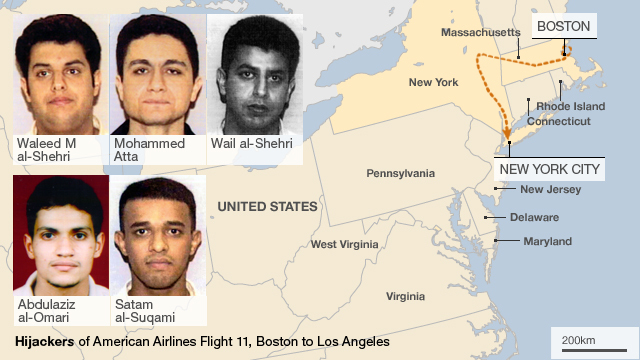 September 2001-In Boston The FBI found a copy of the Koran, a videotape on how to fly commercial jets and a fuel consumption calculator in a pair of bags meant for American Airlines Flight 11. The suitcases belonged to a man with an Arabic name who investigators believe was one of those who hijacked the plane and crashed it into The World Trade Center. The man boarded Flight 11 after flying into Boston's Logan International airport from Portland, Maine, but his bags missed the connection. The FBI seized a Mitsubishi rental car containing Arabic-language flight training manuals at Logan International Airport. The car was rented to two men who were brothers whose passports were traced to the United Arab Emirates and Afghanistan. One of the men was a trained pilot. They were on flight 175. 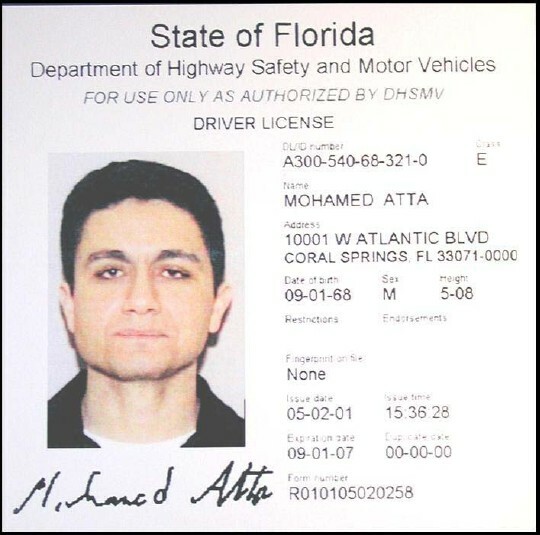 Muhammed Attah who learned to fly at Huffman Aviation in Venice, Florida was on fight 11.
he was born on September 1, 1968 in Kafr el Sheikh, a city in the Nile Delta in Egypt and also carried a Saudi passport. He grew up in Cairo, Egypt and graduated with a degree in architecture from Cairo University. He was apparently not particularly religious during this period. He then moved to Germany, where he was registered as a student of urban planning at the Technical University of Hamburg-Harburg in Hamburg from 1993 to 1999. There are other reports that Atta attended Valencia School of Medicine in Spain during this period, though these may be a case of mistaken identity. In Hamburg, Atta worked on a thesis exploring the history of Aleppo's urban landscapes. It explored the general themes of the conflict between Arab civilization and modernity. Atta criticized how the modern skyscrapers and development projects in Aleppo were disrupting the fabric of that city by blocking community streets and altering the skyline. There were reports that he worked as a car salesman while studying, to help pay for tuition.After he graduated, he took a bus to Aleppo to visit his professor Dittmar Machule for three days on an archaeology site. 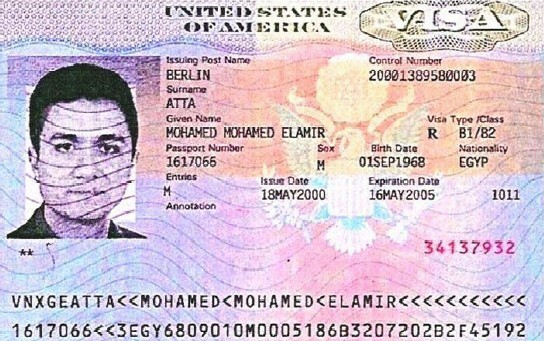 In Germany, Atta was registered as a citizen of the United Arab Emirates. His German friends describe him as an intelligent man with religious beliefs who grew angry over the Western policy toward the Middle East, including the Oslo Accords and the Gulf War. While in Germany, Atta became more and more religious, especially after a pilgrimage to Mecca in 1995. A German terrorist of Syrian origin, Mohammed Haydar Zammar, claims he met Atta at this time and recruited him into al-Qaeda. Atta started attending an Islamic prayer group at the university, and is thought to have been recruited for fundamentalist causes there. Other students remember him making strident anti-American and anti-Semitic statements. That year he also made an unconditional loan of $25,000 to help Muharrem Acar start up a Turkish bakery. In a visit home to Egypt in 1998, his former friends noticed that he had become much more of a religious fundamentalist than he had been before. was from 'Asir Province, a poor region in southwestern Saudi Arabia that borders Yemen. Studying to become a teacher like Wail, Waleed accompanied his brother's leave-of-absence after Wail complained of a mental symptom that had caused him grief, telling their father that he intended to seek aid from a religious healer in Medina. The brothers arrived at the Al Farouq training camp in Afghanistan where they met Ahmed al-Nami and Saeed Alghamdi. The four reportedly pledged themselves to Jihad in the Spring of 2000, in a ceremony presided over by Wail - who had dubbed himself Abu Mossaeb al-Janubi after one of Mohammad's companions. 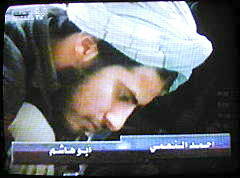 Waleed later served in the security forces at Kandahar airport along with Saeed al-Ghamdi. After being selected for the operation, he trained with the other hijackers at al-Matar complex under Abu Turab al Jordani. Although Wail used the birthdate of September 1, 1968, his father later claimed that he was only 26-years old at the time of the attack.A local teacher, Wail reportedly took leave of his position to seek treatment for a mental symptom that had caused him grief, telling his father that he intended to seek aid from a religious healer in Medina. Waleed, who was then studying to become a teacher himself, accompanied him. Afterwards, they both disappeared for a time, saying they were going to Chechnya to defend Muslims there. This has not been confirmed. The brothers ended up at the Al Farouq training camp in Afghanistan, where they met Ahmed al-Nami and Saeed Alghamdi. The four reportedly pledged themselves to Jihad in the spring of 2000, in a ceremony presided over by Wail, who had dubbed himself Abu Mossaeb al-Janubi after one of Mohammad's companions. Little is known about al-Omari's life, and it is unclear whether some information refers to al-Omari or another person by that name. He has used birth dates of December 24, 1972 and May 28, 1979. He came from Asir Province, a poor region in southwestern Saudi Arabia that borders Yemen. According to a 2003 CIA report, he had graduated with honours from high school, attained a degree from the Imam Muhammad Ibn Saud University, was married, and had a daughter. He is alleged to have often served as an imam at his mosque in Saudi Arabia and is believed by American Authorities to have been a student of a radical Saudi cleric named Sulayman al Alwan, whose mosque is located in Al Qasim. 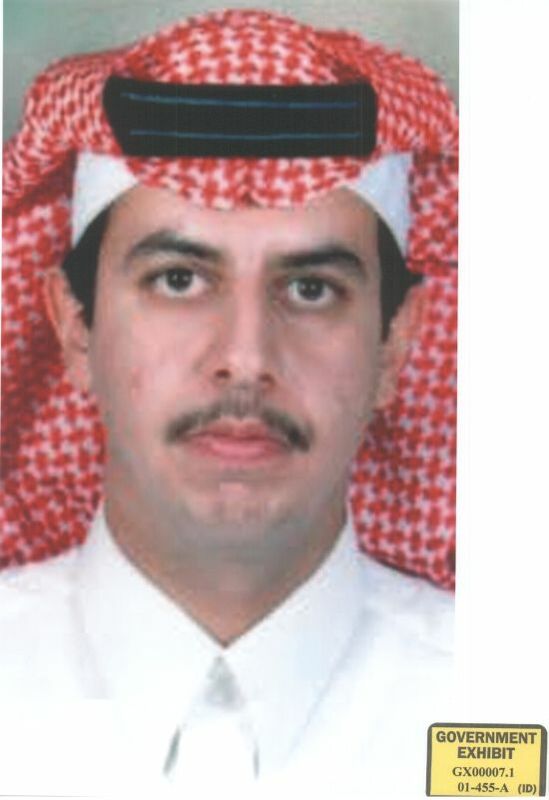 A native of the Saudi Arabian city of Riyadh, al-Suqami was a law student at the King Saud University. While there he joined a (possible) former roommate named Majed Moqed in training for al-Qaida at Khalden, a large training facility near Kabul that was run by Ibn al-Shaykh al-Libi. 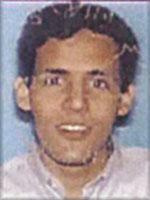 Mohammed Atta is believed to have flown Flight 11 into the North Tower of the World Trade Center. Al-Shehhi was born in Ras al Khaimah, in the United Arab Emirates, to a Muslim cleric. Al-Shehhi was seen as a quiet and devout Muslim. In February, 1996, al-Shehhi enrolled in a language institute in Bonn, Germany. He boarded with a local family. It took two years for him to learn enough German before he enrolled in a university with a military scholarship. Fayez left his family in 'Asir, telling his parents that he hoped to find work with the International Islamic Relief Organization. He only contacted his parents once after that. 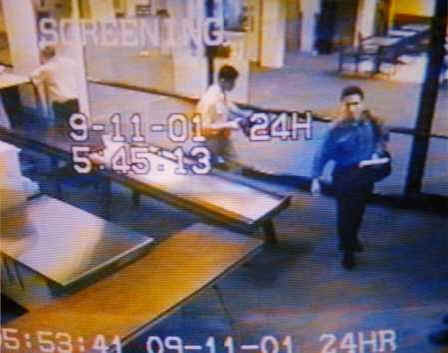 He is believed to have visited the Philippines for three days from October 17-20, 2000. 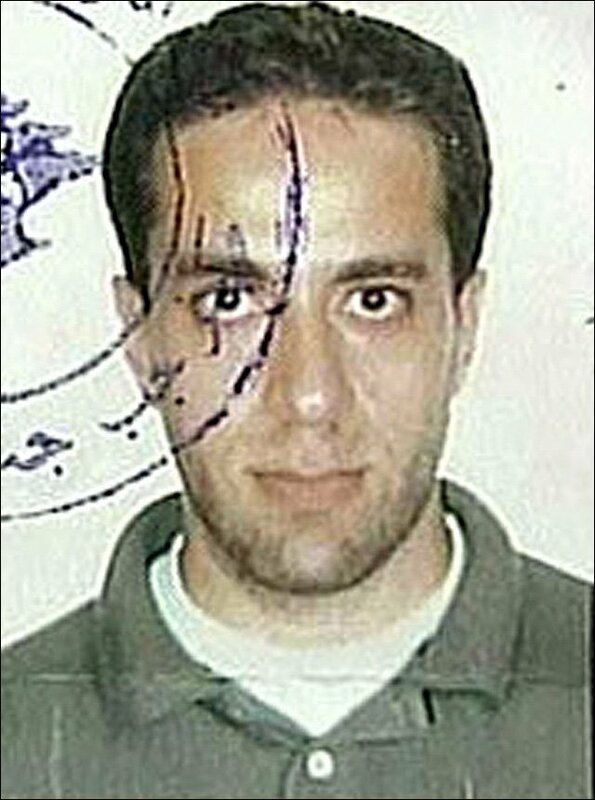 Banihammad used the controversial program Visa Express to gain entry into the country together with Saeed al-Ghamdi. Upon later review of his application, it was noticed that he hadn't listed an occupation or reason for visit, and when asked where he would be living in the country, simply wrote No. However, he still received his Visa. 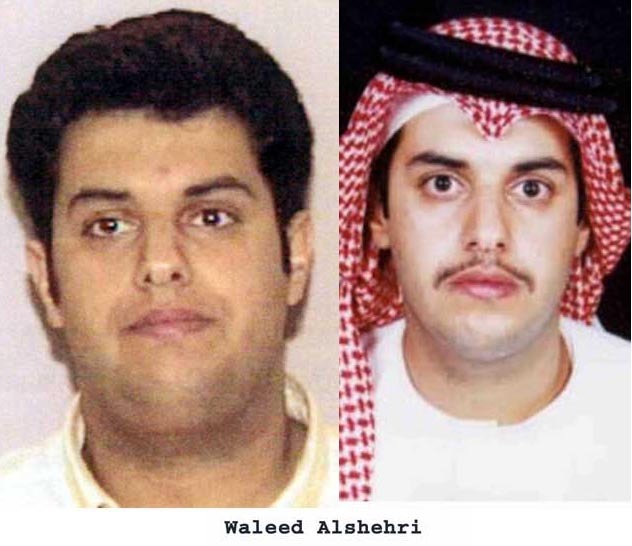 Born 1979, al-Shehri was one of five hijackers to come from the 'Asir province of Saudi Arabia, the others being Ahmed al-Nami, Abdulaziz al-Omari and Waleed and Wail al-Shehri, two brothers unrelated to Mohand. 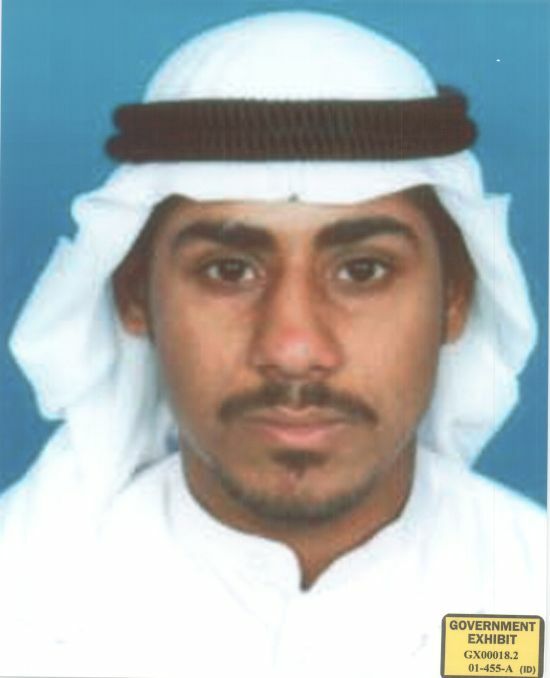 Mohand was a student at Imam Muhammed Ibn Saud Islamic University in Abha, but his growing devotion to Wahhabiism took him on frequent trips to Al Qasim, and as a result he failed his final exams. Al-Ghamdi was from the al Bahah province of Saudi Arabia, an isolated and underdeveloped area, and shared the same tribal affiliation with fellow hijackers Ahmed al-Ghamdi, Saeed al-Ghamdi, and Ahmed al-Haznawi. 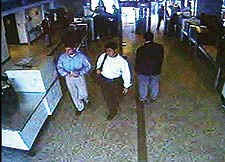 This group is noted as being some of the more religiously observant of the hijackers, and they are thought to have met each other some time in 1999. 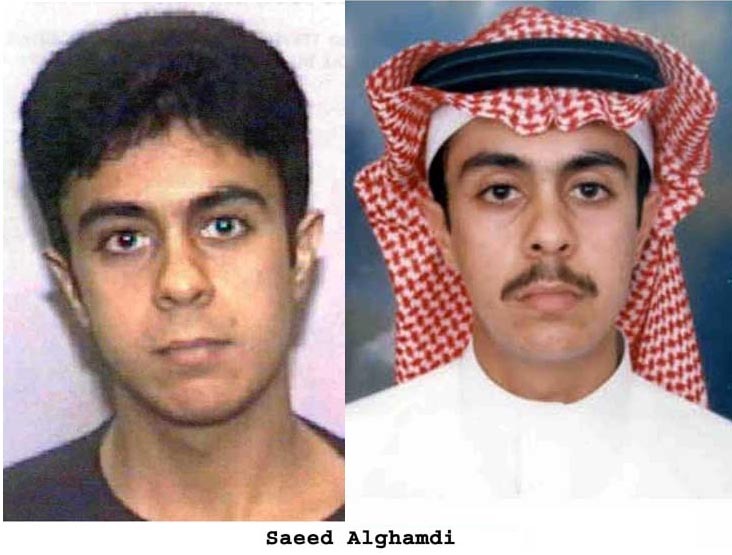 Al-Ghamdi was from the al Bahah province of Saudi Arabia, an isolated and underdeveloped area, and shared the same tribal affiliation with fellow hijackers Saeed al-Ghamdi, Hamza al-Ghamdi, and Ahmed al-Haznawi. This group is noted as being some of the more religiously observant of the hijackers. Al-Ghamdi quit school to fight in Chechnya against the Russians in 2000, and received a US Visa on September 3rd of that year. 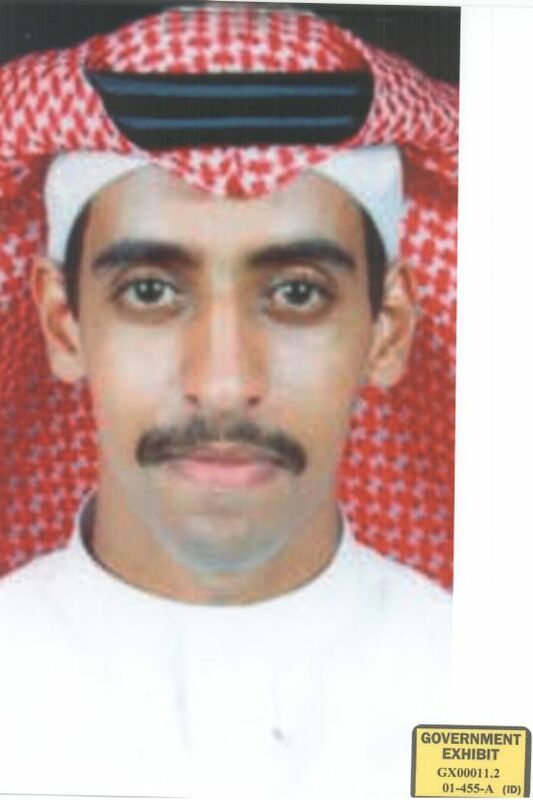 Marwan al-Shehhi is believed to have flown Flight 175 into the South Tower. 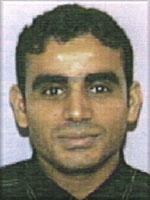 Hanjour was the fourth of seven children, born to a food-supply businessman in Ta'if, Saudi Arabia. During his youth he suggested he may drop out of school to become a flight attendant, although his brother Abulrahman discouraged this route, and tried to help him focus on his studies. 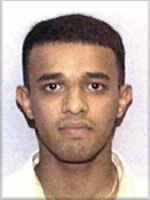 (Cape Cod Times) He was the only hijacker to live in the United States prior to any intentions for a large-scale attack, and was not apart of the Hamburg cell in Germany. Born in Mecca, Saudi Arabia, he went with Nawaf al-Hazmi (another alleged 9/11 hijacker) to Bosnia in 1995 to join the Bosnian Muslims in their war against Bosnian Serbs. Afterwards, both men returned to Afghanistan along with Nawaf's brother Salem, joined al-Qaeda, and fought against the Afghan Northern Alliance. According to al-Mihdhar's family, he fought with Chechnyan Muslims 1998. 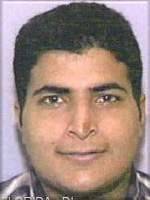 He was the only hijacker known to have been married.On April 7, 1999, al-Mihdhar obtained a US visa through the US Consulate in Jeddah, Saudi Arabia. 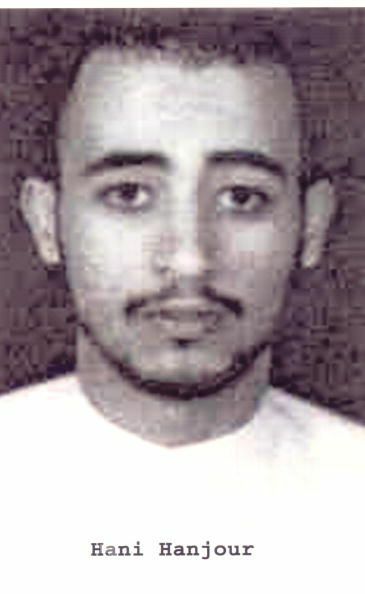 Moqed was a law student from the small town of Annakhil, Saudi Arabia (west of Medina), studying at King Fahd University's Faculty of Administration and Economics, before he dropped out was apparently recruited into al-Qaeda in 1999 along with friend Satam al-Suqami, with whom he had earlier shared a college room. 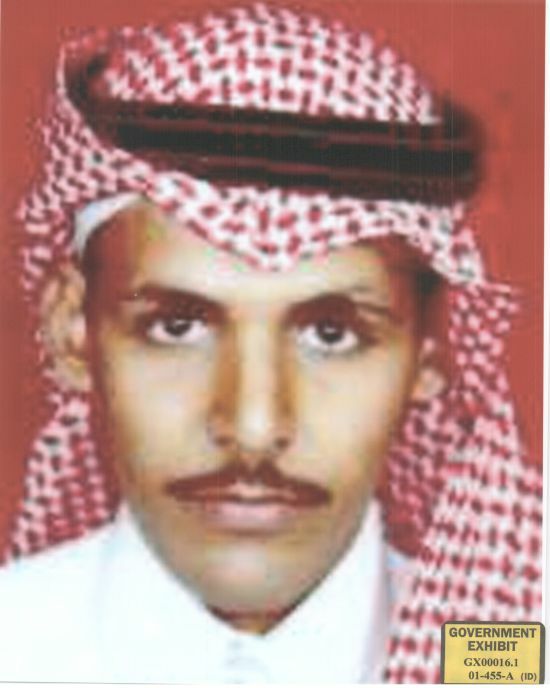 Nawaf was born in Mecca to Muhammad Salim al-Hazmi, a grocer. He travelled to Afghanistan as a teenager in 1993.In 1995, he and Khalid al-Mihdhar went to fight for the Bosnian Muslim side in the Bosnian war. Afterwards, Nawaf returned to Afghanistan along with his brother Salem, and al-Mihdhar. The three there met al-Qaida, and fought against the Afghan Northern Alliance. 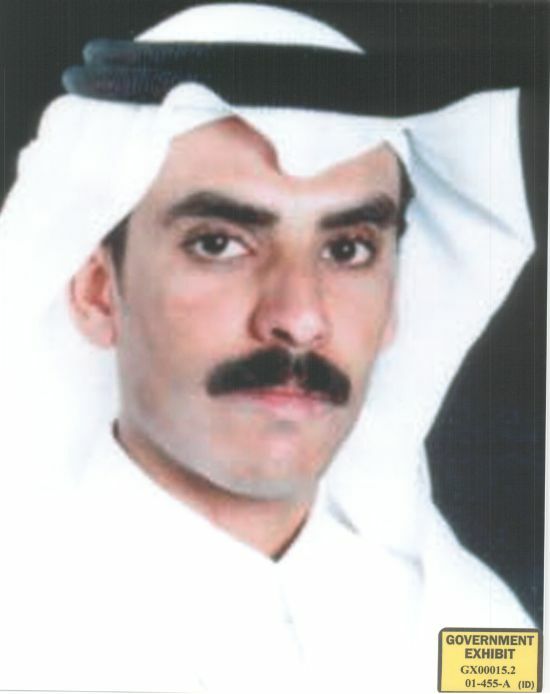 Nawaf al-Hazmi fought alongside Chechnyans sometime around 1998, possibly with his brother and al-Mihdhar, and returned to Saudi Arabia in early 1999. 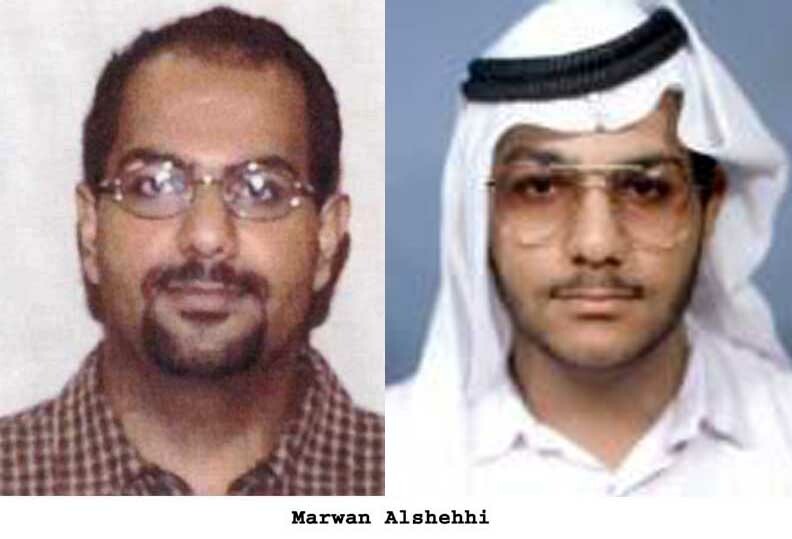 In April 1999, both al-Hazmi brothers and Khalid al-Mihdhar obtained US visas through the US Consulate in Jeddah, Saudi Arabia. Born on February 2, 1981 to Muhammad Salim al-Hazmi, a grocer. There are reports that he fought in Afghanistan with his brother, Nawaf al-Hazmi, and other reports say the two fought together in Chechnya. (The two may not have been actual brothers, although they claimed they were.) 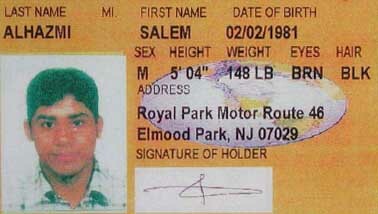 Both obtained US visas through the US Consulate in Jeddah, Saudi Arabia in April of 1999. 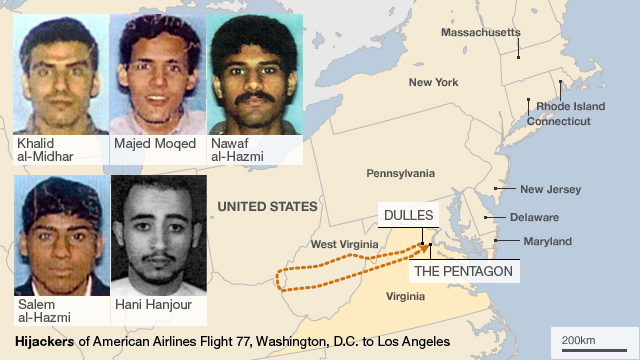 Hani Hanjour is believed to have flown Flight 77 into the Pentagon. Jarrah was born in Mazraa, Lebanon, to a wealthy family. His parents were nominally Muslim Sunnis, although they lived a secular lifestyle. When he was seven years old, Israel invaded southern Lebanon, a fact he referred to later in life. His parents sent him to a Catholic private school in Beirut called La Sagesse, where he volunteered at a camp for disabled children and helped run an anti-drug program. His academic success to this point was mediocre, and his parents arranged for private tutors in mathematics, physics and chemistry. 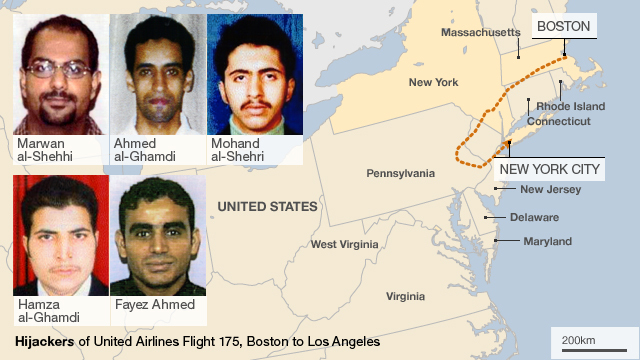 He remained close to his family; he was apparently the only 9/11 hijacker to have close family ties, including with his uncle Assem Omar Jarrah whose work permit would later be found in the wreckage with Ziad's passport. In his childhood, he had always wanted to fly planes, but his family discouraged this. "I stopped him from being a pilot," his father told the Wall Street Journal a week after the attacks. "I only have one son and I was afraid that he would crash." 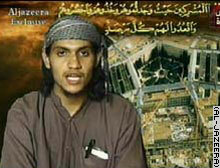 Al-Haznawi was the son of an Saudi imam from al-Baha, an isolated and underdeveloped area, and shared the same tribal affiliation with fellow hijackers Saeed al-Ghamdi, Hamza al-Ghamdi, and Ahmed al-Ghamdi. This group is noted as being some of the more religiously observant of the hijackers. Al-Haznawi announced he was leaving his family in 1999 to help fight in Chechnya, although his father forbade him. His father and brother, Abdul Rahman al-Haznawi, reportedly last heard from him in late 2000, after he made references to training in Afghanistan. Born in Saudi Arabia, al-Nami served as a muezzin at the Seqeley mosque after having reportedly become very religious sometime in early 1999. That autumn he enrolled in the King Khaled University at Abha to study Sharia, he left his family home in Khamis Mushayt in the summer of 2000 to complete the Hajj, but never returned - instead travelling to the Al Farouq training camp in Afghanistan where he meets and befriends Waleed and Wail al-Shehri, two brothers from Khamis Mushayt, and Saeed Alghamdi. Al-Ghamdi was from the al Bahah province of Saudi Arabia, an isolated and underdeveloped area, and shared the same tribal affiliation with fellow hijackers Ahmed al-Ghamdi, Hamza al-Ghamdi, and Ahmed al-Haznawi. 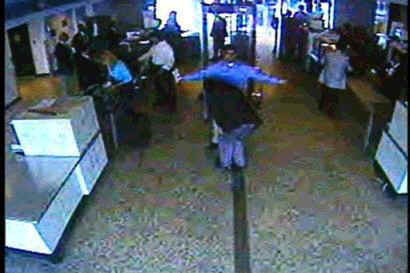 This group is noted as being some of the more religiously observant of the hijackers. Al-Ghamdi is said to have come from a town called Abha. He did not have a college degree. 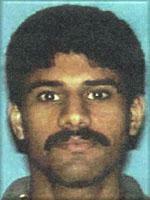 He may have been in contact with other future hijackers as early as 1999. 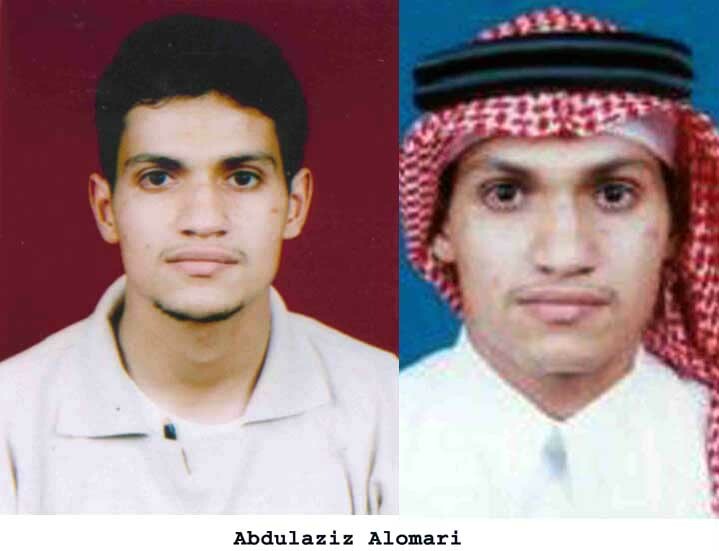 Al Ghamdi spent time in al Qasim province, Saudi Arabia where he transferred to college but soon dropped out and ceased contact with his family. While there, he probably associated with the radical Saudi cleric named Sulayman al Alwan as several other future hijackers did. 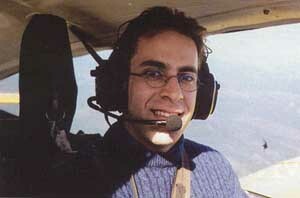 Ziad Jarrah is believed to have crashed Flight 93 into the Pennsylvania countryside to prevent or end an assault by the passengers. Ahmed al-Ghamdi, Saeed al-Ghamdi, Hamza al-Ghamdi, and Ahmad al-Haznawi came from three neighboring towns and belonged to the same tribe. 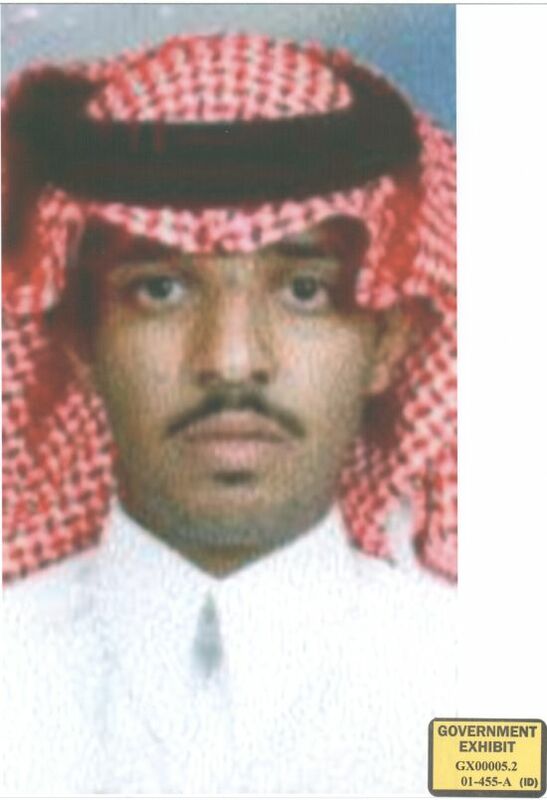 Wail al-Shehri was Waleed al-Shehri's older brother. Salem al-Hazmi was a younger brother of Nawaf al-Hazmi. 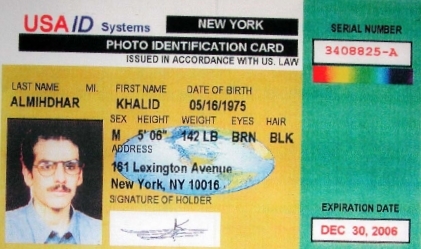 The terrorist attack itself was planned by Khalid Sheik Mohammed and approved by Osama bin Laden; according to the 9/11 Commission Report, Mohammed personally chose the hijackers, and bin Laden approved of the decision. 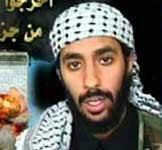 Sheik Mohammed and Abu Zubaydah became the organizers of the plot. 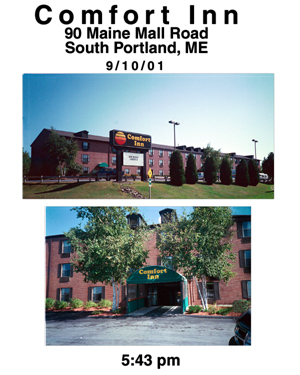 5:43 pm Atta and AL-OMARI checked into the Comfort Inn, 90 Maine Mall Road, South Portland, Maine. 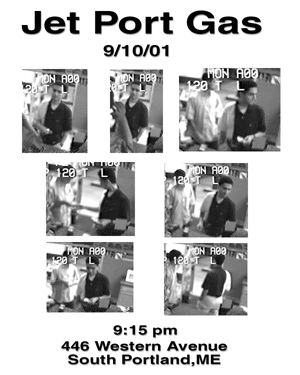 8/9:00 pm Sometime between 8:00 pm and 9:00 pm, two Middle Eastern males were seen at Pizza Hut, 415 Maine Mall Road, South Portland, Maine, for approximately fifteen (15) minutes. 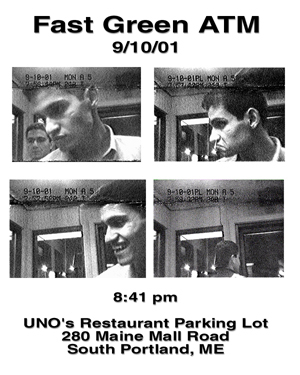 8:31 pm ATTA and AL-OMARI were photographed by a Key Bank drive-up ATM located at 445 Gorham Road, South Portland, Maine. 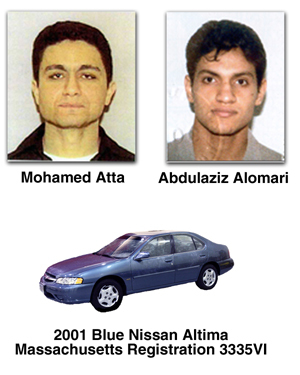 They were driving a 2001 blue Nissan Altima rental car bearing Massachusetts license 3335VI. 8:41 pm ATTA and AL-OMARI were photographed by a Fast Green ATM located in the parking lot of UNO's restaurant, 280 Maine Mall Road, South Portland, Maine. 9:15 pm ATTA and AL-OMARI were at Jetport Gas Station, 446 Western, Avenue, South Portland, Maine. 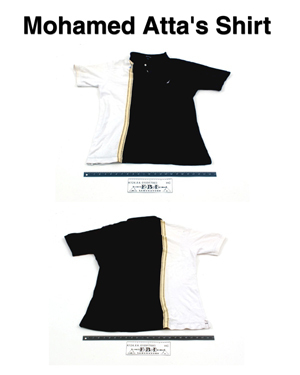 ATTA was wearing a half dark, half light colored shirt with light colored slacks. 5:33 am ATTA and AL-OMARI checked out of the Comfort Inn. 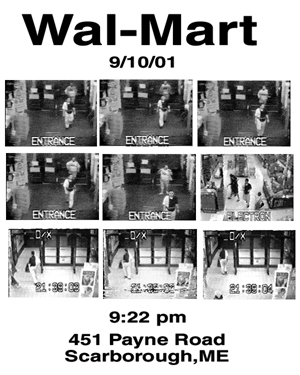 5:40 am The 2001 blue Nissan Altima rental car, bearing Massachusetts license 3335VI, entered Portland International Jetport Airport parking lot. It was parked on the first floor directly across from the airport entrance. 5:43 am ATTA and AL-OMARI checked in at US AIRWAYS counter. 5:45 am ATTA and AL-OMARI passed through airport security. 6:00 am ATTA and AL-OMARI departed on Colgan Air en route to Boston, Massachusetts. 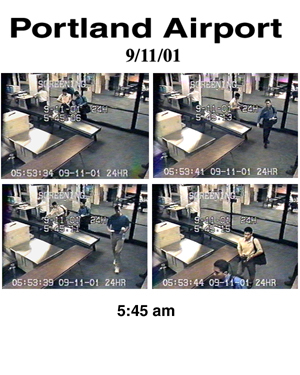 Surveillance video from Washington Dulles International Airport the morning of Sept. 11, 2001 shows Nawaf al-Hazmi, with his brother, Salem, a fellow hijacker. They set off the metal detector checked and allowed to board the plane.